Stanley Ritter, an 80-year-old resident of Deer Park, Texas, says that when he was a kid, people knew not to throw trash on the ground, and they worked to keep their neighborhoods clean. Now that Stanley has moved to Deer Park to be with his family, he’s doing his part to keep the area clean by picking up trash in his spare time.Stanley’s mornings begin with transporting his grandson to school courtesy of his adult tricycle — stopping to pick up trash and litter along the way — before heading off to the local adult center to work on puzzles or the local McDonalds, where he is sometimes rewarded with a free meal. 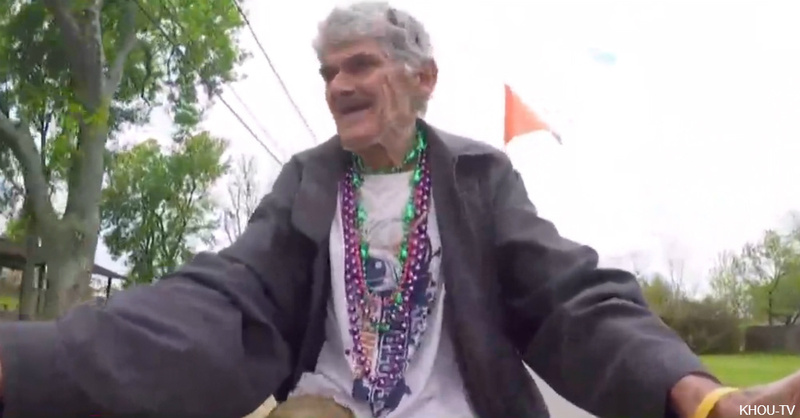 Stanley likes the exercise that he gets from his efforts, and he sees his trash patrol duties as a way to give back to Deer Park, a community he says has been good to him. Residents sometimes mistake Stanley, a retired dock worker, for a homeless person, but he’s quick to point out that he’s not scavenging the area for food — it’s trash that he’s after. He’s well-loved in Deer Park. Residents banded together to give him more than $700 during the holidays. His current tricycle was a gift from a man who noticed that the chain on Stanley’s old bike kept breaking. Stanley says the gift is the most beautiful thing he’s ever received. Stanley plans on continuing to pick up trash for as long as he’s able, and he encourages other Deer Park residents to follow suit. Stanley, who is full of energy and reports that he finds it hard to “sit still too long,” may be onto something. Community service and volunteering, according to researchers, can lead to lower levels of depression, enhanced well-being and a greater satisfaction with life. Watch the video below about this amazing man.